AIZAWL, March 28: Six candidates are in the fray for the lone Lok Sabha seat in Mizoram on Thursday, Election department officials said. 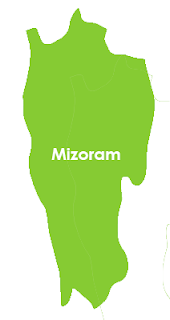 Election to the Mizoram Lok Sabha seat will be held on April 11 simultaneously with the by-poll to the Aizawl West-I Assembly constituency. With no withdrawal of nomination on Thursday, the last date for withdrawal of candidature, six candidates are in the fray for the Lok Sabha seat and three for the Assembly constituency, the officials said. The six candidate in the fray for the Lok Sabha seat are C Lalrosanga of the ruling MNF, Lalnghinglova Hmar, an Independent supported by the Opposition Zoram People’s Movement (ZPM) and the Congress, Nirupam Chakma of the BJP, TBC Lalvenchhunga of People’s Right to Identity and Status of Mizoram (PRISM) and two Independents – Lal Hriatrenga Chhangte and Lalthlamuani. In all, 7,84,405 voters are eligible to exercise their franchise in the State on April 11 in 1,175 polling stations to elect the lone Lok Sabha MP of the State.